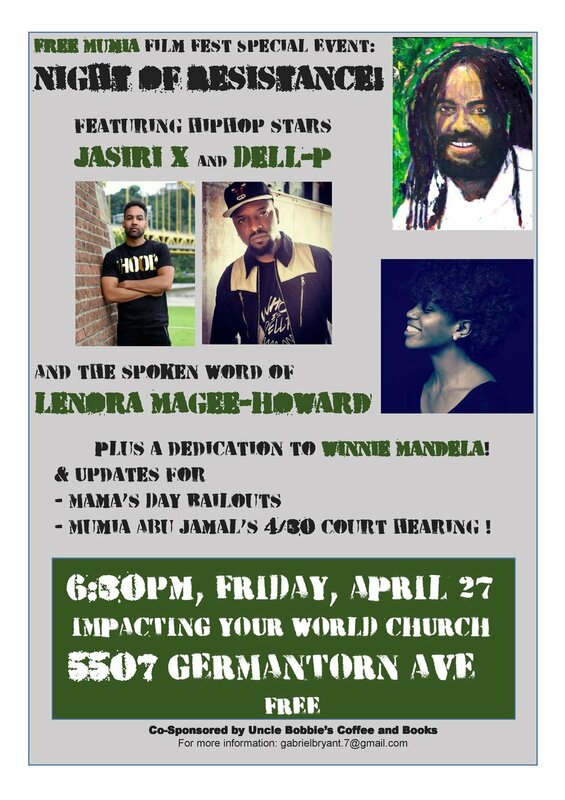 This forum will focus on the cases of Mumia Abu-Jamal, a political prisoner, and the Juveniles Lifers Without Parole in Michigan who are in prison, in violation of several U.S. Supreme Court rulings stating that such sentences are unconstitutional. •	Kimberly Annette Simmons-Woodson, former juvenile lifer without parole, served 30 years, founder of Redeeming Kimberly, a service that assists newly returning citizens navigate coming home. •	Siwatu-Salama Ra, an environmental and racial justice activist, was wrongfully convicted for defending her family from assault by waving an unloaded gun at the assailant, despite having a CCP (Concealed Carry Permit). For Mumia's birthday this year, on April 24th, we are calling for educators everywhere, across the nation, and even internationally, to facilitate a teach-in at your school, college, university, or other institution of learning in order to bring increased attention and mobilize support for the case of Mumia Abu Jamal as we step up the fight to BRING MUMIA HOME!! The teach-in that educators facilitate can occur at any time throughout the day or night, on Mumia's birthday- April 24th but the walkout is set for 1:00 p.m. Eastern time (or 10:00 a.m. PST) if at all possible for students to walkout at the same time and stream their walkout LIVE via social media for the world to see support from students all over the country (and even internationally). If you are planning to participate in the teach-in and walkout at a school/college/university near you please make note of the school where you will be below in the comments section so we can get a sense of the level of participation and we will know where to send media to capture images of the walkout. Links to curriculum ideas for possible programs for the teach-in will also be listed below; if you have curriculum ideas to add, please post and I will add them to the list. PLEASE help to spread the word about this event, inviting all educators and students you know so we can work together to FREE MUMIA!!! “TODAY, the government of the United States, its corporate media and its liberal prison-war complex is pretending to celebrate Dr. Martin Luther King Jr. They peddle a sanitized façade of him, a Black Santa Claus who brought us “a dream” in his sack. Don’t stand in the way of justice! Do NOT appeal Judge Tucker’s decision. You can request a PDF copy of the flier by emailing mobilization4mumia@gmail.com. PHILADELPHIA, Jan. 14 -- Community activists and leaders from the Philadelphia region will hold a news conference 11:00AM, Tuesday, January 15 at A-Space, 4722 Baltimore Avenue to demand Philadelphia District Attorney Larry Krasner not stand in the way of justice for convicted journalist/activist Mumia AbuJamal, by not appealing the ground-breaking decision by Pennsylvania Common Pleas Court Judge Leon Tucker which would give Abu-Jamal the right to reopen his appeal. This news conference comes a week after over 4,000 petitions were delivered to Krasner’s office demanding he not appeal Tucker’s ruling. The Tucker decision is an important ruling that could impact other prisoners whose appeals were similarly denied. The community also has questions regarding the recent “discovery” of six boxes of files on Abu-Jamal’s case in the DA’s Office. The files were allegedly found on Dec. 28, 2018 after Tucker had already announced his decision, but the discovery wasn’t revealed until January 7. Krasner ran on a platform of reform and transparency. The activists, many whom supported his election, are now asking Krasner to keep his promise and do the right thing by Abu-Jamal. Speakers from a broad range of backgrounds will raise these and other questions about this latest scandal in the Philadelphia DA’s Office and call on the Krasner to not appeal Tucker’s decision. Abu-Jamal’s supporters will rally to demand Philadelphia District Attorney Larry Krasner not challenge this decision. Community activists will gather in front of the DA’s office, 3 S. Penn Sq. across from City Hall, on Saturday, Jan. 5 at 12 noon. Because of expected rain, participants will march to William Way LGBTQ Center, 1315 Spruce St for an indoor event. Judge Tucker's ground breaking ruling could impact many other prisoners whose appeals were similarly denied. Abu-Jamal’s supporters will rally to demand Philadelphia District Attorney Larry Krasner not challenge this decision. Community activists will gather in front of the DA’s office, 3 S. Penn Sq. across from City Hall, on Saturday, Jan. 5 at 12 noon. The DA's Office will GIVE A STATUS REPORT on how they will handle the Williams precedent in Mumia's case. Come to the courthouse to let them know that we demand they comply with the precedent: Mumia should never have had one of his appeals heard by a judge who was formerly the DA fighting his prior appeals - and NO ONE SHOULD! Mumia should win the right to have his appeal heard fairly! It's important to pack the court on both March 27 and April 30, when this series of court proceedings is expected to end with a final decision on Mumia's bid to re-open his appeals. As of today we are happy to announce that the organizations below have agreed to initiate the March 27th Offensive to Free Mumia Abu-Jamal expecting, of course, the many other organizations that signed onto the International Call to join us. 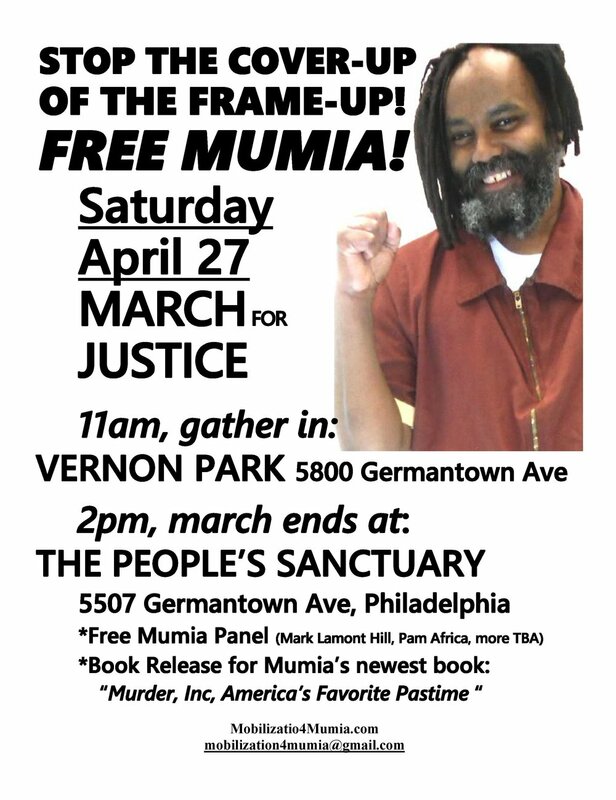 Though the court hearing will be until April 30, we are asking all Mumia supporters to hold rallies March 24-27 to help raise awareness about Mumia's case as well as the cases of many other political prisoners and of mass incarceration. 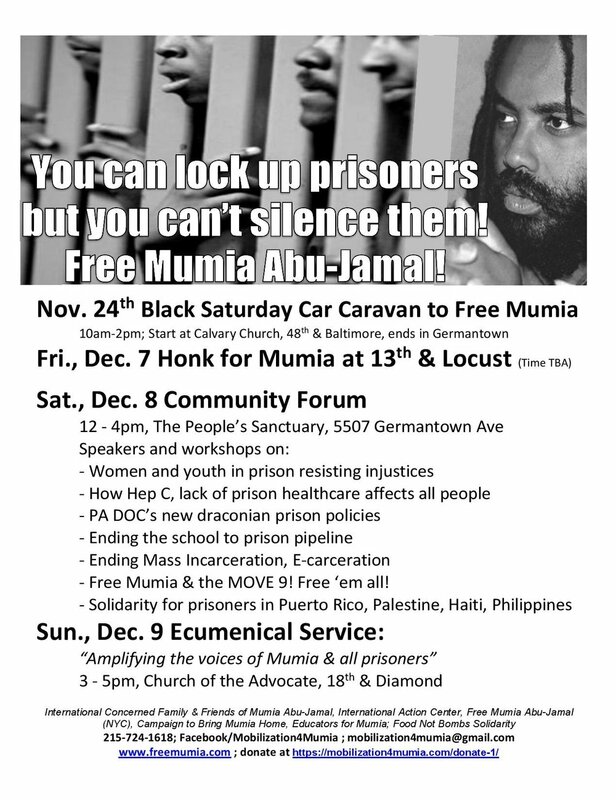 We have set up an event page for the Offensive to Free Mumia which people around the world can now access, at freemumia.com. We also have a form, below, on which you can submit your activities/ events/ demonstrations so that we can post them. And, of course, the court hearing will take place on Monday, April 30 so that all eyes will be on Philadelphia that day. Bus arrangements from New York City are being planned, and people from other cities and countries have begun to let us know that they are planning to come to Philadelphia on that day as well. We have received several commitments regarding people coming from France. Also, we got word that there is some planning for an activity afoot in Senegal. Please let us know as soon as you can about any plans you may have for events or for coming to Philadelphia on April 30. A luta continua, and onto a successful international offensive leading up to and on Monday, April 30! Following information will NOT displayed. Judge Leon Tucker has called for the Philadelphia DA's office to come to court with a progress update on their understanding of the precedent set by the decision in the Williams case, which could win Mumia a chance to present his original appeals in with judges not shown to have boas against his case - from the PA Supreme Court onward. A series of speakers will discuss the challenges of ending mass incarceraation featuring: Marc Lamont-Hill, Michael Coard, Pam Africa, Hakeem Browder (brother of Khalif Browder), Bret Grote (lawyer for Mumia Abu-Jamal). Gather at the Rizzo statue at 1401 JFK Blvd in Philadelphia to march for Mumia! Teach-in and book release party for Mumia's new book "Have Black Lives Ever Mattered?"